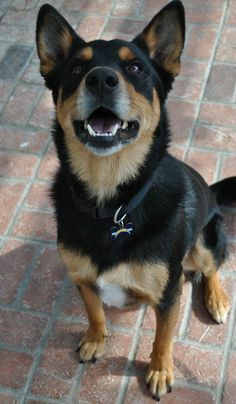 The German Shepherd Rottweiler Mix is one of the strongest mixed breeds I can think of. And, when someone asks me about these dogs, I feel like I must underline that it’s important for future owners to ask themselves if they’re the right type of person to own such a dog, before wondering if this crossbreed is the right choice for their family. To help you understand if you’re ready to bring home such a pet, I came up with a list of things that make these dogs so special. 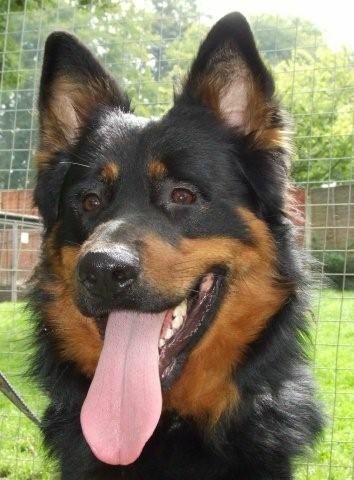 To understand better the German Shepherd Rottweiler Mix, we should take a closer look at her parents. The German Shepherd is considered the strongest dog breed in the world, not just for their physical strength, but also because they’re aware of it and know how to use their bodies to attack and defend themselves. 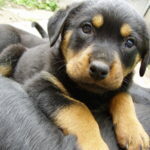 Rottweilers are in the Top 3, according to the same list. They have powerful shoulders and leg muscles, being used in the past to pull small wagons and to guard ranches. By mixing these two great dogs, breeders have obtained a strong, very intelligent crossbreed, with great watchdog abilities. However, crossbreeding can’t guarantee a puppy’s temperament. You can’t know from the beginning if your dog will be more like the German Shepherd, or if she’s going to inherit the Rottweiler’s potential aggression. 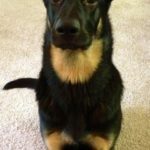 This can be a problem if you’re a first-time dog owner, because your lack of experience will allow your large and very intelligent dog to become the pack leader in your house. 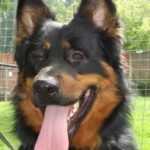 An adult German Shepherd Rottweiler Mix is usually between 22 to 27 inches tall (56-68 cm) and weighs between 75 and 115 pounds (34 – 52 kg). It’s essential that you train her before she gets close to these dimensions, in order to keep your dog out of trouble. Usually these dogs are loyal, affectionate, and develop a strong bond with their families. As long as they’re properly trained and socialized, they’re great with children of all ages, and can even get along well with most pets. However, when they lack training, they can have little or no respect for rules and their excellent watchdog abilities will make them overprotective and even aggressive. 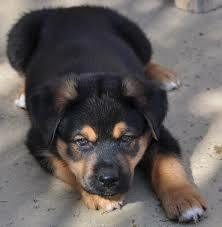 You should start trying to train your German Shepherd Rottweiler Mix when she’s as young as 5-6 weeks. Be patient, but firm, and use positive reinforcement only. These dogs are fast learners, as both their parents are obedient, highly intelligent, and like to please their owners. If you’re consistent, you can obtain great results without any professional help. If you’re planning to adopt an adult dog, check to see if she’s been properly trained before bringing her home. Training an older dog requires more time and patience, and there’s a chance you’ll need to take her to obedience classes if she shows signs of aggression. 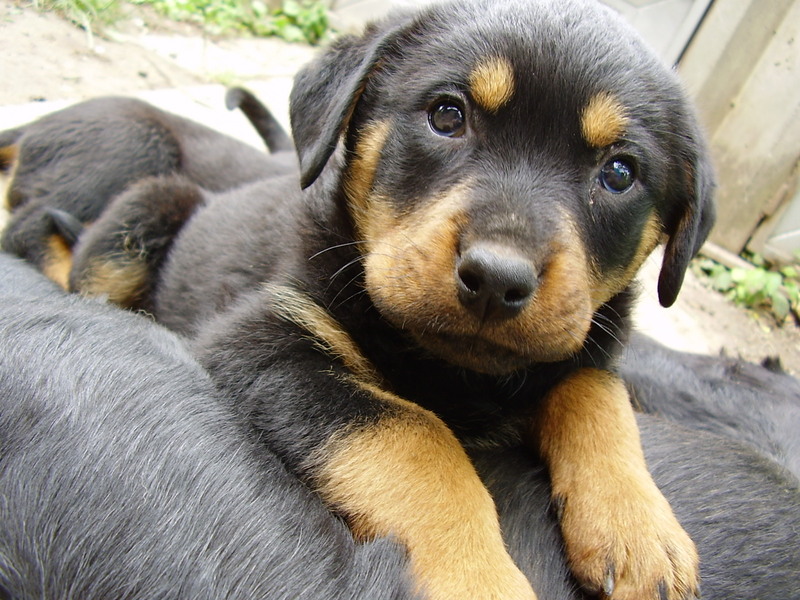 Most of these dogs inherit the short coat of their Rottweiler parent and need moderate brushing, once or twice a week. But there are puppies who’ll look more like the German Shepherd, which means that their coats will need daily brushing, because they’ll shed regularly all year round, and worse during shedding season. 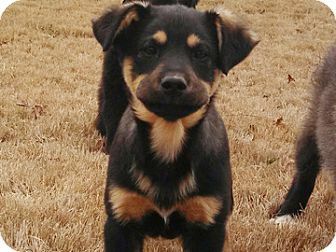 With mixed breeds you can’t know what your puppy’s coat will look like, and you need to be prepared for all cases: short, harsh, dense, straight, or thick. Whether you’ll have to deal with some hair, or a lot of it, you should get a pet hair vacuum cleaner just in case. This tool will be your best friend, especially during the shedding season, when you’ll be cleaning your carpets almost daily. brush her teeth almost daily. If you’re planning on getting such a dog and keeping her inside all afternoon, on the couch watching TV, then you should reconsider your plans. 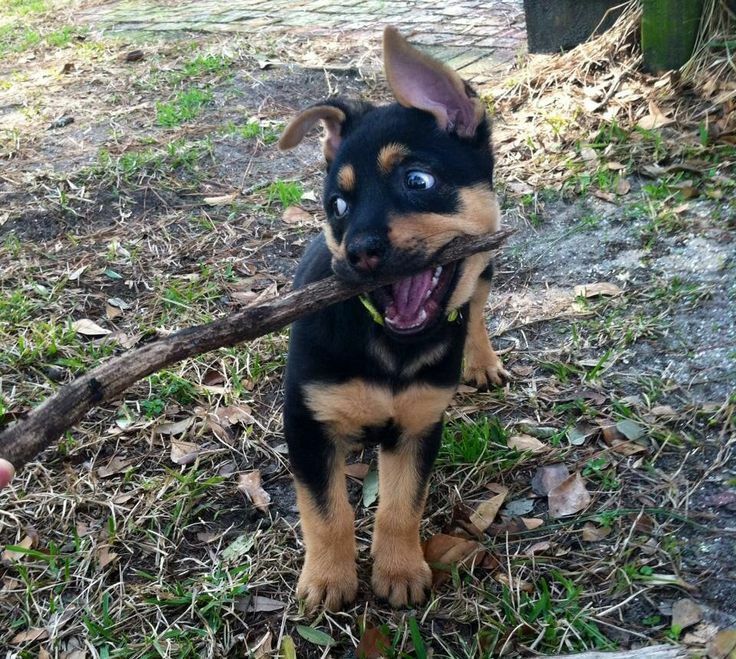 A German Shepherd Rottweiler Mix needs exercise to stay in good health. Being very intelligent, this dog also needs serious mental stimulation. Keep her busy with training sessions and interesting games every day. Your puppy should be exercised according to her age and physical abilities. Take her for several 10-minute walks during the day, keep catch sessions short, and don’t make her your jogging companion until her bone structure is strong enough. As an adult, your dog needs to be active for about two hours a day. Split this time between one or two 30-minute walks, a trip to the dog park, and some short play sessions. They usually like playing catch or Frisbee, and can also use some time spent on their own in the yard. 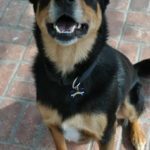 It’s not uncommon to see a German Shepherd Rottweiler Mix running, jogging or hiking with her owner, but not all dogs are the same. Make sure your dog is ready for such activities before putting her through such intense exercising. Large breed dogs are rarely suitable for small houses, with no yard in which to move freely. If you keep your German Shepherd Rottweiler Mix locked up all day, she’ll get bored and will develop a series of behavioral problems. 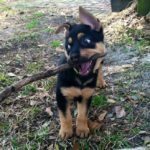 Destructive chewing is often seen in both German Shepherds and Rottweilers, so you can expect a similar response from your dog if you leave her all by herself every day. If you know you’ll have to keep her cooped up for a few hours every day, start crate training when your dog is still young. Choose a dog cage for large breeds and furnish it with resistant chew toys. These dogs can also develop excessive barking when they get bored, which is stressful and annoying, especially for your neighbours. If you work too much, hire a pet walker or take your dog to a daycare, where she can get involved in some interesting activities in your absence. Despite their impressive looks and strength, almost all large breeds run the risk developing a series of medical problems. 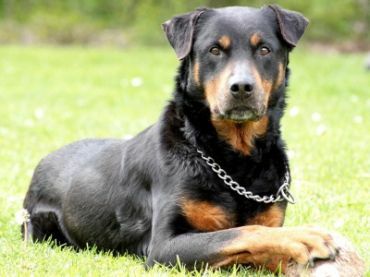 A German Shepherd Rottweiler Mix is no exception, even more so as both the Rottweiler and the German Shepherd are famous for their specific health issues. Some of these problems can be prevented or treated if you’re willing to keep a close eye on your dog. Schedule your dog for a DNA test for inherited diseases, follow all your veterinarian’s recommendations when it comes to vaccination, and make sure your dog has a balanced diet that’s adapted for her needs. 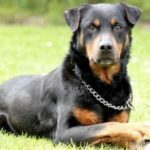 Buy your German Shepherd Rottweiler Mix from a reputable breeder, as this is the only way you’ll get to know more about her parents’ health history and their temperaments. This information is essential when you have to deal with such a large dog that’s prone to the medical issues mentioned above. there are too many hereditary diseases in your dog’s family history. 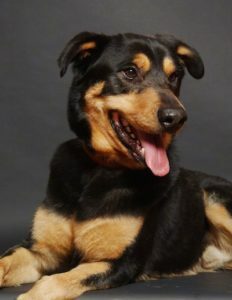 A German Shepherd Rottweiler Mix is a very special dog, and I think she can easily find her place within any active family. She’s loyal, likes to please her owners, and is a great play companion for kids. However, owning such a dog is a big responsibility, as she needs proper training and might require special medical care when she gets older. I’d say she’s not the best option for people who work too much, and have little time to offer to a dog. What do you think? Do you have any experience with this dog? Would you like to share your home with one? Leave a comment below and tell us whether you’re the right owner for such a dog or why you’d rather choose another breed. Norma is 17 years old. she is almost blind and deaf. She is in liver failure but otherwise playful and seems to be in good health. she sees a vet regularly. Just tonight she is having a hard time walking. Her back legs seem to not be working. She is panting more than usual. But is eating and drinking. She doesn’t seem right or normal to me. I’m concerned. What your vet tells? If nothing specific, try to visit another one. Hope Norma will be fine, despite pretty serious age. Our shepherd mix is doing very well at 15 yrs old. She gets adeqaun injections 2x monthly (or as prescribed), and metacam each night. And when the vet was sure she tore her knee ligament, we did NOT waver, and continued with the program…meaning NO to surgery. Also one vet in LA does a human laser, not a canine cold laser. Our girl Sheeks gets around and navigates our 2 story house like a 7 year old. My Rottweiler Mix is 8 years old…he’s a grand Ole guy to be around due to his gentle and quiet nature. He’s been this way for a very long time now. I agree when a puppy proper crate training for times away is the only plan to keep your home from being destroyed and keep your human/dog relationship in good condition. Unsupervised outdoor time to save your home will result in outdoor damage and upset neighbors as well as puts your dog at risk for abuse by kids such as teasing or throwing rocks etc or neighbors tired of the barking and taking matters into their own hands. That’s too much of a risk on your dog. Crate train and not only intend but look forward to your time out with your dog. At least 90 minutes a day. No dog should go more than 5 hours without being allowed to relieve itself. Sure they can do it but it’s not fair to them. I have had great success hiring people nearby that are home alot and get him out halfway through my workday. Morning walks 45 mins minimum and evening 45 mins minimum and as often as possible that time spent at dog park so he can just be a dog with other dogs. Lots of indoor time with you being apart of a pack not outside alone. Everyday lay down with them and give them 15 or more mins one on one talking to them petting…no distractions. It’s a full commitment 7 days a week which is why so many people fail their dogs. They do the opposite of everything mentioned here and wonder why their dog is a lunatic. Dog ownership isn’t for people with little time to be at home or weekend warriors going here n there. Most dogs live a miserable failed life because of their master or parent. The rest being unfortunately a much smaller percentage live wonderfully balanced lives and bring great happiness and fulfillment to the owner. I’m one of the lucky ones but learned the hardway when I was much younger. I still regret failing my dog in my early 20’s. I wasn’t a cruel owner but I failed miserably. I took those lessons and did it the right way and since my late 30’s my human/dog relationship is one of the most enjoyable and important aspects of my life…. Richie, sounds like the both of you have grown together to make a fine wine pair of happy personalities. I enjoyed reading of the knowledge you’ve gained. 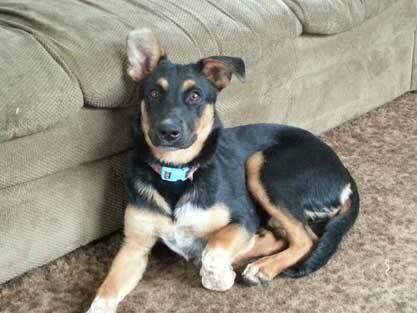 I had a Shepard Rotweiler mix already. Don’t tell my other dogs but he was the best dog I have ever had. Now I want to get another one. If you have one you know a firm hand is needed. That does not mean they need to be physically harmed just have structer in their life. I want another one to join our pack consisting of a Pit Bull and an American Shepard both happy and well loved and trained. 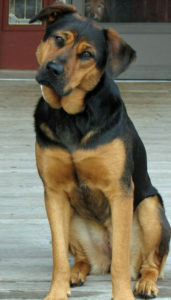 Our Rottie an sherphard mix is 4 spunky years old .She is a joy an funny as can be . SHE IS VERY bossy ,an pitbulls doesn’t like her. We have a fence in yard she stays in other than tbat she thinks pir bed is hers .These are great dogs vefy protectice ,she herself doesnt like night time company of any kind ,it makes her a little bit more aggresive . LOVES TO RUN AN PLAY ALTHOUGH SHE DOSNT PLAY FAIR AT ALL.But the best Dog our family has ever had. About 3 years ago I saw a dog on one of those pet Facebook pages. She looked a lot like my other dog which is a German Shepherd/ Blue Heeler mix so I said “I have to have her” she was the cutest thing (I named her Harper). When I met the lady to pick her up I fell in love she was so cute and sweet. The lady that sold her to me did not know what breed she was, did not know how old she was and when I took Harper home and got back on Facebook to thank the lady again, she had deleted her Facebook page….Also this poor thing was nothing but skin and bones. I took her to the vet and they said they thought she was about 5 months old, I got her shots and they gave her a clean bill of health just said she needed to gain some weight. 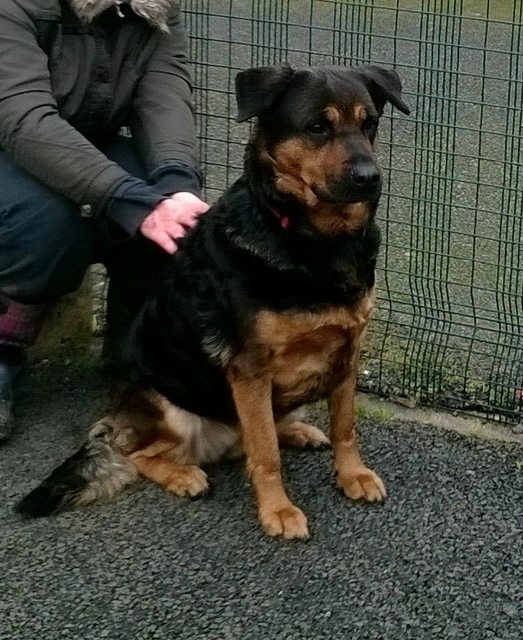 When I asked the vet what they thought her breed was they said they weren’t sure but maybe a German Shepherd mix. But anyways I have had problems with Harper since she was around a year old attacking my mothers dog and fighting with my other dog over food and toys. I now have to feed my two separately. I have been trying to work with her and she seems to get better but then in an instant she just snaps……………………………I was searching German Shepherd mix dogs on google today and a picture showed up that looked so much like my Harper and I mean exactly like, I actually thought it was a picture of her. 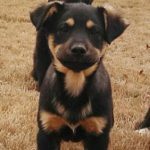 I got on here and saw that the breed of the dog that looked like her was a German Shepherd/ Rott mix and after reading information you have put on here about this breed, it explains so much. I really think that she is this breed. So I just have one question for you….Is there still hope for my Harper? She is almost 3 years old and I love this dog so much she can be the sweetest thing and I really want to get her trained. There is always hope! Keep training. Maybe you should get a professional trainer. Even for a couple of hours to tell you what to do in this situation. And then you’ll be able to maintain training yourself. Good luck! My Luna girl was the sweetest, smartest and most beautiful dog I have ever known. She died of cancer at 11 1/2 just a few months ago. (It’s the rotti side that is prone to the kind of cancer she had.) I will not be getting another dog anytime soon, but when I eventually do, this is the only breed of dog I would ever have. Her awareness and perceptions were astonishing. She was never in a real fight with another dog – although she was attacked on two occasions and I intervened – and she never bit another dog or a human. Assertive and somewhat dominant at play, she was an alpha female but not aggressive. 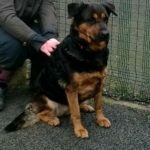 I just adopted a 1yr old Rottweiler cross and she is the best dog i have ever had. She obviously had a little bit of training before we adopted her, but she is also learning very quickly. Also, she is amazing with kids (youngest she’s met was about 1yr old) we have a couple of nieces and she loves to play and cuddle with them. She is such a dream come true. Hi, I just rescued a beautiful Rott/GS mix. He is approx 4 to 5 months old and his previous owner had to unexpectedly move but was a good parent to Jax. He is quite smart and the previous owner taught him sit and paw. That is cute and all but I am having a bit of trouble getting him to stay, pay attention to me, walk on leed properly and he continues to “go” in his crate overnight even when he gets taken out at midnight and again in morning. I’ve only been working with him/had him for a week. I’m sure with proper training he will get better. Any suggestions on how to get his attention or to stop playing tug o war with the leed? Am I being too hopeful that I will be able to settle him down at this age? I have showed small dogs in the past but nothing this large haha. I do have some experience with training small breeds but this breed seems to not be responding to well to my techniques. Jax is a sweet, playful, loveable big lug and he seems to love his new environment. We sure love him! Thanks! I recently retired in a neighborhood of dog owners, one owner had 8-10 Maltipoos and and family member dropped off to them this big “teddy bear” looking Puppy. They asked if we would give him a home. 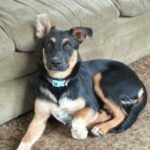 He is a Rottweiler-Shepherd mix and is hard-headed, a little “standoffish”, very playful, protective and loving …But he is 1 year and 5 months old and rarely barks. Why could this be?